Rhinos are an ancient race of animals and have been roaming the earth in various stages of evolution since the late Eocene, 33 million years ago. Today, they are one of the most endangered species on earth and although Namibia has had great success in resurrecting their numbers they are mainly restricted to nature reserves in Namibia, such as Etosha National Park and the Waterberg. Only the first two are native to Africa and apart from their address, Black and White rhinos are distinguished from the rest by their lack of front teeth. These two versions of the species are so similar that in theory they could crossbreed, but there are still differences between the black and white rhino, and none of them have to do with colour. Thanks to having no incisors, both the black and white rhino are forced to use their lips to crop off vegetation in order to eat, and this gives us a clue as to their different diets. The white rhino, has the typical flat wide muzzle of a grazer, while the pointed-lipped black rhino is equipped for browsing on leaves. Since neither rhino is in actuality black or white, but rather the same colour as their latest mud bath, it is believed that the name ‘white’ may have originated from the Afrikaans word, ‘wyd’ which means ‘wide, and the use of the word black for the other species is just a matter of opposites. and search for the more secretive and solitary black rhino (unless they have a calf at foot) among dense thickets, while the rare desert-adapted black rhino roams the arid expanses of the Kunene. Despite the bad rap that the black rhino gets, earning its place on the Big Five by virtue of its aggressive nature, they owe their volatile behaviour to a timid nature fuelled rather by poor eyesight (a trait it shares with its more laid-back cousin), than aggression. They are nervous and unpredictable, making tracks to disappear at the slightest hint of human presence, but will charge at anything they perceive as a threat. Cows with calves are particularly volatile. The white rhino is equally short-sighted and can be aggressive, although their habitat allows them more time to assess a situation before assuming the worst. White rhinos are larger than their grumpy relatives, tipping the scales at 2 tons and standing 1.8m at the shoulder. 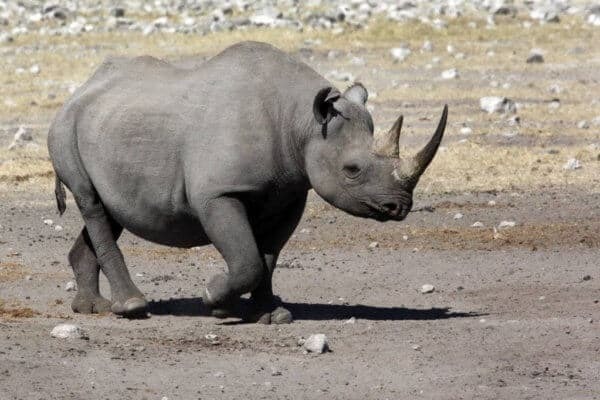 Their bodies, heads and necks are longer and they carry their heads lower than the shorter coupled black rhino which has a sloping back and hips. Black rhinos can weigh up to 1 400kg and reach 1.6m high. Both species are at serious risk of extinction although white rhinos outnumber black rhino more than 2 to 1 with about 20 000 individuals to the black rhino’s 4 800. They are equally attractive to poachers and are the focus of concerted, ongoing efforts to conserve and protect them. Look some of these up, and see how you can help!